The name Stewart Brand (above) is linked to http://www.longnow.org/10klibrary/library.htm. Now the 10K in “10klibrary” refers to the Long Now Foundation‘s mission to look forward at least ten thousand years, including sub projects to look at long-term file format conversions; similar to some of the aspirations of the Memories for Life UK Computing Grand Challenge. The Royal Mail has had a lot of bad press recently with strikes, postal delays and ‘modernisation’. However, it is easy to forget the revolutionary nature of the “Penny Post“: one price and one service to deliver anywhere in the country. Living in Tiree, one of the western Scottish islands, this is particularly pertinent. Many carriers do not deliver here or only do so at a higher rate; those that do are often delayed waiting for the ferries, but so long as the plane comes in so does the post. 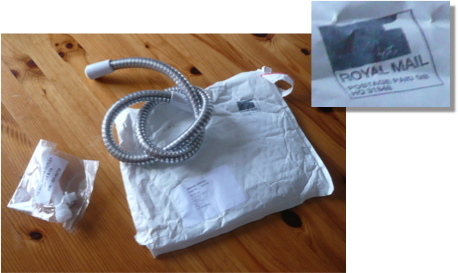 Our shower was leaking water and on Friday at around 12:42pm we ordered spare parts from Shower-Warehouse. I had assumed that they would not arrive before I set off back to Lancaster on Tuesday morning and so it would be Christmas before I could actually do the repair. So top marks for both the Royal Mail and Shower-Warehouse and may modernisation never change the wonder of universal post. I’m on the ferry on my way to Tiree. I’ve not been back home for nearly 8 weeks and have a long weekend before heading back down to Lancaster until Christmas. Since I left in mid September I’ve slept in 19 different places and had 23 moves between places; however, my main home has been the camper van, a Ford Transit Auto-Sleeper Duetto, small enough to manoeuvre easily, but with everything on board from cooker and fridge to its own toilet and shower! Perhaps over the next few days I can catch up with the half-written blogs amongst the unanswered email, overdue papers, and pressing admin; and also take some time to appreciate the sea and wild wind.